Joshua 1 verse 9: “Haven’t I commanded you: be strong and courageous? 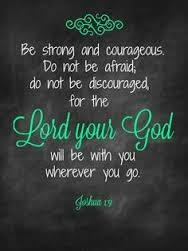 Do not be afraid or discouraged, for the Lord Your God is with you wherever you go”. Thia sort of strength is more than physical strength, because even though one can be strong in the physical, it doesn’t mean we have courage. “Be strong and courageous; don’t be terrified or afraid of them. For it is The Lord your God who goes with you; He will not leave you or forsake you”. Moses was handing leadership over to Joshua, and Joshua was to lead the People into the land, The Lord had sworn to give their fathers. The first time they were to enter the land, it was only Joshua and Caleb, out of twelve who said it could be done. Now some 40 years later, when a generation had pass, the younger generation was going to take the land. Joshua was to lead. There are things in our own life we know we should do, but fear holds us back. Perhaps we can reflect on Joshua, he had just taken over from Moses, He had a nation to lead into a new place. We all have new lives in Christ Jesus, but we need to take new ground, a ground where we leave our fears and doubts don’t hold us back.. The reason we can leave our fears and doubts behind is ’The Lord your God is with you wherever you go. Fears and doubts can destroy plans, and fears and doubts had held back the people Moses was leading, once, from taking all that was promised to them. God has plans for us all, Jeremiah 29 verse 11: And He calling us to accept the plans He has for our lives. So what Our Lord and Our Friend is telling us, We can be scared and afraid and wonder if we are doing the right things, But we can be strong and courageous, because He is with us, and our strength comes from Him. That kind of strength doesn’t not have to be waited for, or even conjured up, it simply comes from a life in Him. Romans 8 verse 1; Then there is no condemnation either.